Hey everyone! I know I mentioned this product as part of my Best/Worst of NYC video, but I thought it deserved even more explanation. I've been using this liquid liner ever since I ran out of my traditional Revlon Colorstay Liquid Eyeliner (which I swear by- I think it's awesome). But for less than 2 bucks, I decided to give this a try just to see if it could compare. I saw in a magazine that it was listed as one of Megan Fox's favorite beauty products, so I thought it just might work. And for me, it's awesome! So many liners I've tried have either not dried fast enough, have been too thin, irritated my eyelid, had a metallic finish, etc. This one actually gave me practically the same finish as Revlon Colorstay, but I think I like the longer applicator and brush tip even better. Seems to just go on faster and more smooth for some reason. Plus I paid about 5 bucks less for it! I was never a makeup snob before watching you and the other makeup gurus. Just the opposite. I went years at a time without buying any makeup at all. Now I've tried so many new things, including a few high-end products that I never thought I'd buy. It's so nice to be able to get someone else's thoughts on something before I buy, and to see how a color looks on a person. I'm having so much fun experimenting with new colors and new looks. Yes I do now have NYC eyeliner. It's actually the only liquid eyeliner I have, and it seems pretty easy to use. Thank you so much for all your videos. Have you tried their Smooth Mineral pressed powder? It was on GMA. Really good! i agree! i love nyc liners, liquid and pencil. i love that their stuff is super cheap, since i am super cheap, but usually it works great. Hi, Emily! My boyfriend and I just had the same issue in our apartment with the AC. Our carpet in one area was SOAKED; the landlord told us to move our couch away from the main vent and that seemed to have helped. On another note, I have been trying drugstore products more since reading your blog and watching your videos. I am normally a MAC and Dior addict, and I'm happy to say that I'm loving drugstore brand eyeshadows and other makeup. i bought two of the nyc liquid liner (sable and pearlized black but i'm kinda hesitant to open it because after i bought i looked it up and heard all kinds of negative reviews about it flaking and taking a long time to try and it not being for beginners (this one would be my first liquid liner). i was thinking of returning the two and getting a revlon one instead. 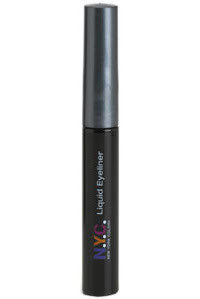 So I went and purchased the eyeliner, I'm not big on liquid eyeliners, i could never use them! But i thought i give it another try and i must say, I LOVED IT!!! Thanks to your reviews on drugstore make-up, I've stepped out of my MAC and department store ONLY bubble! I've purchased Milani make-up, Covergirl, NYC and my husband is shocked!! And extremely happy! =) Thanks for the reviews you've done! They're so helpful!! i totally 100 % agree with you. i swear ive tried every liquid eyeliner even paying up to like 25 dollars for one and who knew my favorite one would be a dollar and come from a drug store? the brush is perfect for precision lines and the color never smears. its my favorite eyeliner of all time. Glad you have it too. I got the NYC eyeliner too ..I passed it over several times thinking it wouldn't be good quality and decided I could risk $2. I found that if you just use one single swipe, it actually works well. If you go over it a couple of times and thicken the line it tends to do the flaking thing. If you let it dry after the one swipe and tap on some black/brown whatever color shadow on top with an tiny brush that will totally stop the flaking. I like that it also comes off easy and I don't have to tug @ my eye like you do with waterproof formulas. I also like the Maybelline liquid liner in the pot with the felt applicator (not the brush) .. it's like $5, is waterproof, and lasts all day.